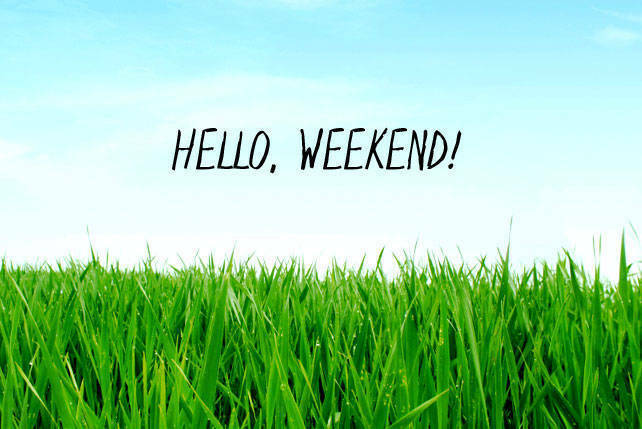 Take your pets for a day-out this weekend, shop for the most fashionable and exclusive brands under one roof, sneak a peek at new and promising plays, and more. 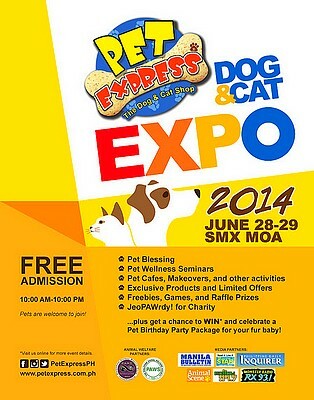 Now on its third year, the Pet Express Dog & Cat Expo 2014 will be on June 28 and 29, 10 a.m., at the SMX Mall of Asia. Numerous dog and cat brands offer limited deals and exclusive products. The expo will also feature booths about pet photography, and grooming and wellness seminars that will deal with skin health and dental care for your pets. Expect plenty of games for pets and owners, too. JeoPAWrdy!, a charity segment with various dog organizations, will also raise money for animal welfare groups. 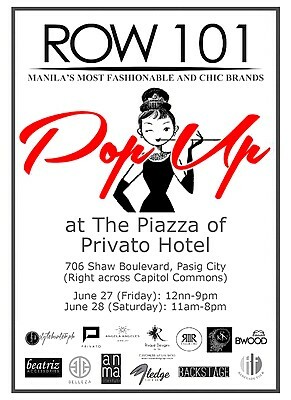 Drop by Row 101 Pop-Up Store, happening on June 27, 12 p.m., and 28, 11 a.m., at The Piazza of Privato Hotel. Check out exclusive men’s and women’s clothing. Row 101 brings you Manila's most fashionable online brands under one roof. The newest pop-up store curates the everything from clothing, leather goods, and accessories, giving you a chic shopping experience this side of the metro. Shop from brands like Stylehunter.ph, Florence Fling, AMProject Shop, Backstage Clothing, Fledge, and many more! Tickets are P100, covering the door charge, light snacks, and refreshments. A make-up station will also be set up in the venue where guests can avail a free make-up session with Jim Ros of Maybelline. 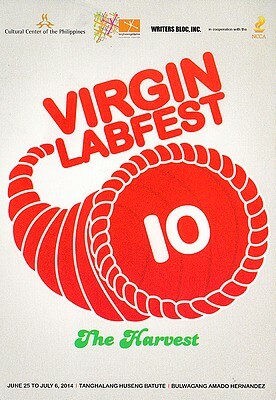 The Virgin Labfest 10 kicks off on June 25, 3 p.m., at the Tanghalang Huseng Batute in CCP. It will run through July 6. Included in this year’s festival are Anonymous, The Missing Peace, Last Ten Minutes, Betang, and Imbisibol, among others. The Virgin Labfest is a laboratory festival of new plays by emerging and established Filipino playwrights, held annually at the Cultural Center of the Philippines (CCP). The Virgin Labfest aims to provide Filipino playwrights a venue to present their unpublished, unstaged, untested, and untried works to the theater-going public. 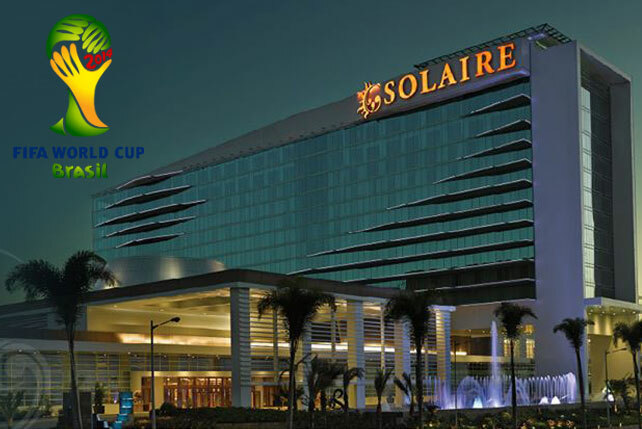 It is a yearly project of the Manila-based playwrights group Writer’s Bloc, Inc., acclaimed theater company Tanghalang Pilipino, and the Cultural Center of the Philippines (CCP), in cooperation with the National Commission for Culture and the Arts (NCCA). For the full schedule, click here. For ticket inquiries or reservations, call 891-9999. Red Bull Thre3style has officially made its way to the Philippines. For the first time, one Filipino DJ will be given the chance to compete at the Thre3style World Championships, to be held later this year in Baku, Azerbaijan. Thirteen DJs will be pitted against each other in two qualifying rounds. Of the 13, the top three DJs from each qualifier will advance on to the finals. 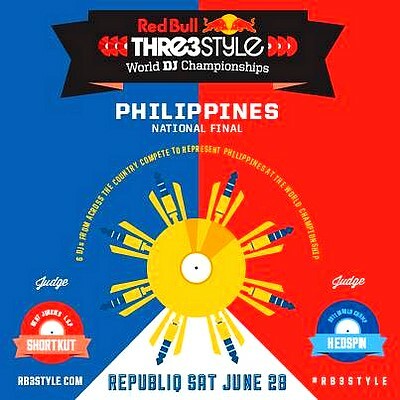 Witness the Red Bull Thre3style National Finals on June 28 at the Republiq Club. Watch DJ Kristian Hernandez, Nikita del Rosario, and Carlo Atendido battle it out this Saturday/ Judging the events are 2011 Thre3style World Champion Dj Hedspin and 2014 Thre3style World Finals Judge DJ Shortkut who will be basing their decisions on the following criteria: originality of track selection, mixing creativity, technicality of mixing, stage presence, and crowd response. 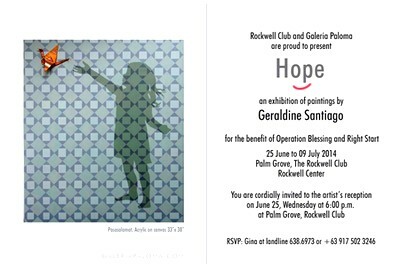 Galeria Paloma and the Rockwell Club are pleased to present Hope, the launching exhibition of the artist Geraldine Santiago, on June 25, 6 p.m., at Palm Grove, Rockwell Club. Proceeds from this exhibition will be donated to relief efforts in Tacloban via Operation Blessing Foundation and Right Start. It will be on display until July 9. This is Santiago's first solo exhibition, which features 14 new paintings by the artist, with origami cranes and silhouettes of children as motifs. Santiago’s subjects are playful but fragile, and her art celebrates their strength while also discussing (without words) the need to protect what is vulnerable. 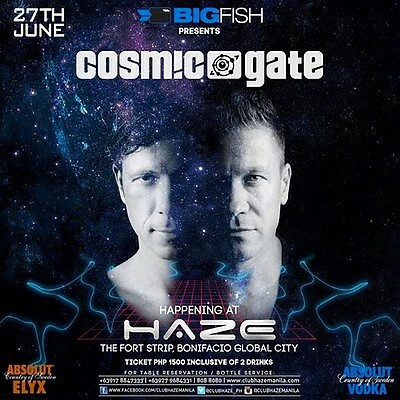 This Friday, all roads leads to Cosmic Gate Live on June 27, 10 p.m., at Club Haze. Don’t miss as Nic Chagall and Bossi come together for a party that you cannot miss! The perfect union of musical minds, one karmic meeting in a recording studio resulted in Cosmic Gate's Big Bang moment. It set brothers-in-sound Nic Chagall and Bossi on a rapidly expanding path-one that's seen them evolve into Germany's most consistently successful electronic music duo. Through their atomic on-stage synergy, Nic and Bossi have created countless unforgettable dance floor nights. They've sold out arenas & festival halls, conquered EDM capitals, and hosted their own stages at major festivals. Driven by their hugely received albums, club-busting singles, and scene-defining classics, their place in EDM's hall of fame has long since been secured. Tickets are priced P800 (pre-selling price) and P1,500 (door charge). 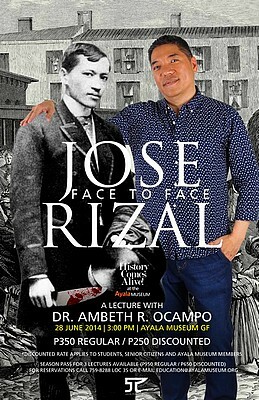 Watch history come alive with Ambeth R. Ocampo at Face to Face: Jose Rizal on June 28, 3 p.m., at the Ayala Museum groundfloor. History is the past recreated from traces left in books, manuscripts, photographs, and artifacts. Go through the primary sources in search of a hero fossilized into monuments of bronze and marble. With historical research, it is possible to see the Philippine's national hero, Jose Rizal, face to face. Professor Ambeth Ocampo, historian, columnist, and scholar, is back to continue presenting little known information, curiosities, and mind-blowing trivia on Philippine historical figures. Tickets are priced P350 and a discounted P250. Season pass for the three lectures are priced P950 and P650(discounted). For reservations, call 759-8288 local 35 or email education@ayalamuseum.org. 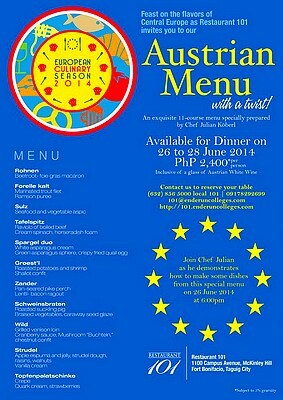 Don’t miss Restaurant 101’s Austrian Menu, available from June 26 to 28. As part of the European Culinary Season, Chef Julian Koberl will give a cooking demo on June 26, 6 p.m., at Enderun Colleges’ Culinary Amphitheater. The dinner, on the other hand, features 11 courses-for P2,400 per person. Go on a gastronomic adventure to Austria with a beetroot-foie gras macaron, marinated trout filet, shallot confit, and many more! For reservations, call 856-5000 local 101 or 0917-829-2699. 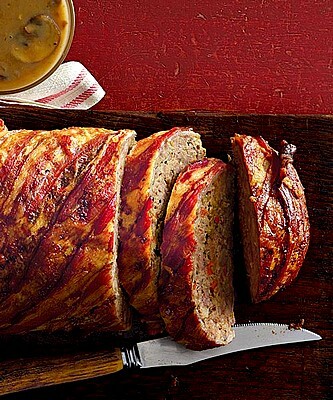 On June 27, 7 p.m., indulge in everyone’s favorite guilty pleasure with a spread of delectable American tapas, including the mouthwatering bacon-wrapped Meat Loaf with Sauerkraut, at Mandarin Oriental’s monthly Wines and Tapas Night. Savor the unlimited sumptuous spread, artfully paired with exquisite fine wines, for P1,500 net. Limited seats only. 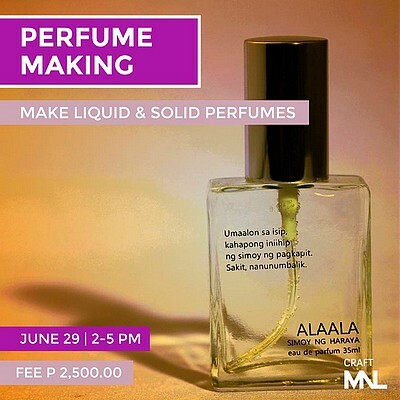 Join Craft MNL in a three-hour Perfume-Making Workshop with Lala de Leon of Simoy ng Haraya on June 29, 2 p.m., at The Collective. Learn how to use fragrance oils and alcohols and create custom scents! Each participant gets to bring home four bottles of liquid perfume and up to 10 pots of solid perfume! The workshop fee is P2,500.